Francis Rodriguez Family Child Care is a family run business operated by Ms. Francis Rodriguez. 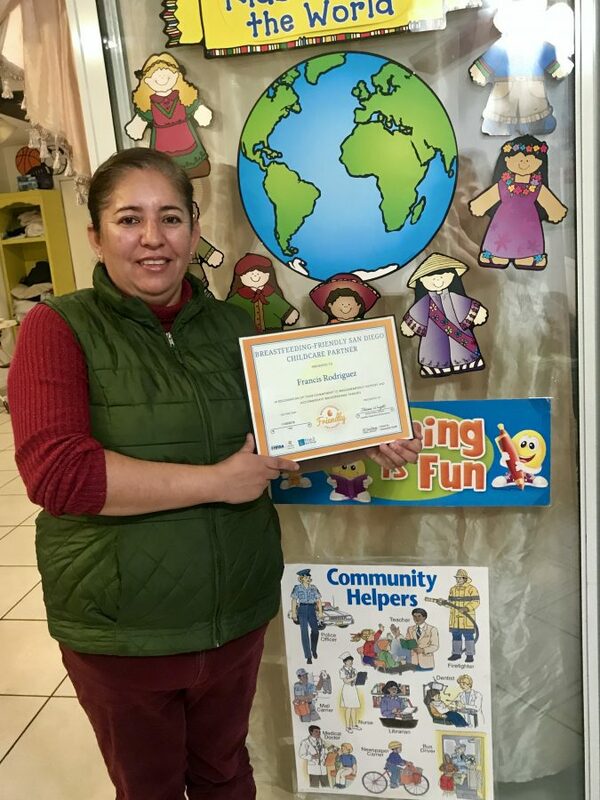 Ms. Rodriguez and her family have been running the childcare for the last 14 years and pride themselves on supporting children and parents in every need they have. Ms. Rodriguez ensures that all the children in her care know their letters and numbers and are prepared for the transition to school. Ms. Rodriguez and her family offer services 24 hours a day and provide care in both Spanish and English. When Ms. Rodriguez received information about the Breastfeeding-Friendly San Diego (BFSD) program from her YMCA contact she knew she wanted to participate. As a provider who wants to support families, Ms. Rodriguez believes BFSD is a good tool to support parents and for business. Ms. Rodriguez believes that offering a space for parents to breastfeed will help with bonding, she states: “I encourage parents to spend time with the little ones before drop off”. Congratulations Francis Rodriguez on becoming a recognized Breastfeeding-Friendly San Diego provider!